Uses a strapper so that it loads either FTB1 or FTB2 for you. It takes about twice as long to start up, so if it doesn't come up when you hit the menu, wait a minute. 2.) Go into the MS_ROOT folder of the file you downloaded. 3.) Open your PSP in USB mode. 4.) Drag the contents of the MS_ROOT folder you downloaded to your Memory Stick's Root. If you do not know what your Memory Stick's Root is then read THIS. NOTE: NitePR can also be used while using BakonICE. BakonICE may not work on PSP's with firmware 3.80 and below. If this is the case download the BakonICE 1.91 Old Firmwares.zip file. so now you can make it were it wont play your animation? 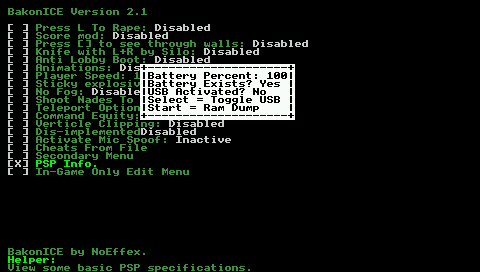 Yes, just remove or rename your pspbricker.txt file. So exactly what is new about this one. and it doesnt give the ban message rite? nope it doesnt ur hack free!!! !